The newly expanded Walker Art Center has opened in Minneapolis. Thousands of people attended festivities for the center. Many travelled from across the country, even from around the world for the event. They say the art world is watching the Walker Art Center with curiosity and enthusiasm. Minneapolis, Minn. — In honor of the Walker Art Center's opening, the Minneapolis Institute of Arts hosted a reception for the Walker's out-of-town guests. The evening was part of a larger effort to show how Minneapolis is a major player in the arts world. Several hundred people showed up from such notable American institutions as the Museum of Contemporary Art in Los Angeles and the Whitney in New York. Others travelled even farther. Curator Milada Slizinska came from Warsaw, Poland. "It's always interesting to see, to watch, to face the changes in the museum world. And I think this reopening of Walker is very special because of the fantastic Walker tradition," says Slizinska. For Slizinska, part of the Walker tradition includes community outreach. The Walker planned a full weekend of activities for its out-of-town guests. The highlight for many of the international guests was visiting private art collections in homes throughout Minneapolis. Slizinska says while museums show contemporary art in Europe, few people collect it. "It was incredibly encouraging and interesting," says Slizinska. "It was a good lesson to see how the Walker program is influencing local people to collect, to buy, to invest, but also to love art." Slizinska says she feels a certain affinity for the Walker. She thinks of her own museum as being a bit off the beaten path for art lovers, much like the Walker. She says she's eager to learn from the Walker's success. Augustin Perez Rubio travelled from Spain. He's just taken on the job of chief curator at the newly opened Museum of Contemporary Art of Castille and Leon. He says the new Walker is a model for museums around the world. "Because for me it's very important, the idea the Walker Art Center has as a cultural center," says Rubio. "It's about theater, dance, video, films. I think nowadays this is one of the most important things; that it's not only about art, but more the creation." Rubio says he's impressed by how the Walker is using its building to house the creative process as much as the creative product. The Swiss architectural team of Jacques Herzog and Pierre de Meuron designed the Walker expansion. Dr. Christoph Grunenberg, director of the Tate Liverpool, came for the opening -- in part for the architecture. Herzog and de Meuron designed the Tate Liverpool's cousin, the Tate Modern, to wide acclaim. Grunenberg says he thinks it's a major coup for the Walker to have the first building completed in the United States by Herzog and de Meuron. 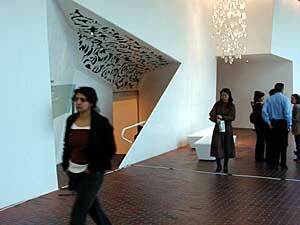 He ranks the Walker in the top 10 contemporary art museums in the world. "In the field of modern contemporary art, it's really out there and has been for quite a while," says Grunenberg. "And like any organization, it will have to strive to maintain that position. However, with a completely splendid new building by some of the best architects in the world, it probably shouldn't be that difficult to maintain that position." Grunenberg says museums around the globe have a lot to learn from the Walker Art Center. He says the opening of the new Walker, with its unique design and ambitious programming, sends a strong message to the global arts community. "It doesn't matter where you are. If you have the ambition, if you have the vision, if you have the backing of the community -- you can actually make a real difference." And that message, Grunenberg says, is a good one.